Can New York Reach 20 Points? It’s a rough time to be a New York Red Bull or even be a fan of the Red Bulls. After 19 games the club is in dead last in the league standings and with only 11 games remaining on the season slate many wonder where this club is heading including ownership over in Austria. Players are questioning many things right now and some like Juan Pablo Angel have gone as far to say as he’s never been in a situation like this ever before. If we weren�t in the situation that we�re in right now, I wouldn�t have played today,� Angel told Goal.com. While owners and players question where the club is going one has to think that Juan Carlos Osorio and maybe even technical director Jeff Agoos could be seeing a pink slip in the very near future. Since the club owns the league’s worst record at 2-13-4 and with only 10 points through nearly two-thirds of their season I question more and more not of whether or not Osorio and company will have jobs soon but if the club has enough in the tank to get even to 20 points on the season when it is all said and done. Its a tough question to ask of this club since they are playing so poorly and are going pretty much no where anytime soon. Their schedule has beaten them down pretty badly but does let up a lot in the final months of the season, even with two CONCACAF Champions League games against Trinidad and Tobago side W Connection. We knew going into this summer that the Red Bulls had a tough time cut out for them on the road. But out of their final 11 games they do have seven home games, including a five-game stretch against some western conference clubs and a couple eastern rivals. One would have to think that out of those five games the Red Bulls could get at least 10 points right? Let’s look at it, their 20th game of the year is a big one against the LA Galaxy (with the MLS return of David Beckham). That one will be a circus that they could win or at least draw I would think. A trip to Colorado is after that before the All-Star break, I’d nearly go ahead and put a loss in the column for that trip. But after the two games with W Connection we see the five game home stand. Chivas, Dallas, Columbus, New England and KC all come to town. Now we have no idea how clubs will be in a month or so but let’s say for fun the Red Bulls get two draws, two losses and a win out of this stretch. It’s possible and probably pretty fair to say. After that however comes another three game roadie out west to San Jose, Chivas and RSL. I can’t imagine this group winning on the road in any of those places right now. Maybe a draw if they are lucky in San Jose but that is about it. Last but not least is a home game on the final week of the season against Toronto. I fully expect TFC to be battling out for a playoff spot that week and will be needing the three points in a big way while New York can just play that lovely spoiler role. So is ten points too much to ask for from this side in their final 11 games? I see it being possible but with the moral of this club being so low it would be hard to imagine anything better than what we are seeing out of them right now. What do you think? Can the Red Bulls get to 20 points on the year when the season is over or will they be stuck in the teens and become one of the worst ever? Not good for the league when one of your biggest markets has the worst record. Hopefully fans will still show up to the new stadium next season. I hope that they do. They would be the Derby of MLS. The truth is that if Red Bull had not backed into the playoffs last year thanks to DC United, and posted a 2-2-1 record to reach the Cup Final, Agoos and Osorio would have been fired last November. It is amazing that 2 playoff wins overshadowed an extraordinarily mediocre season (Red Bull was 12-13-10 with the playoffs in 2008). Anyways, somewhere in LA Bruce Arena is laughing. Great point. I've been saying for a while that people got too caught up in the fact that both NY and RSL were very below average going into the playoffs before they made their way to the conference finals. Still Osorio has lasted longer than most NY coaches. Great point. I’ve been saying for a while that people got too caught up in the fact that both NY and RSL were very below average going into the playoffs before they made their way to the conference finals. 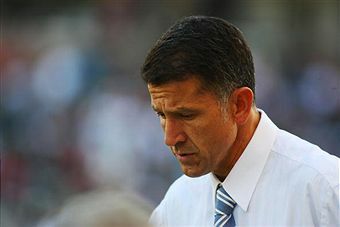 Still Osorio has lasted longer than most NY coaches.